You know that car you always see with the crowd around it at the local cruise night? Well. this is it. Beautifully finished. 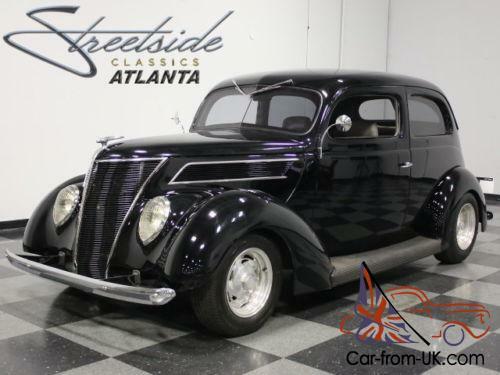 this 1937 Ford slantback 2-door sedan shows off what the ideal combination of modifications and style can do to what was once just a transportation appliance. 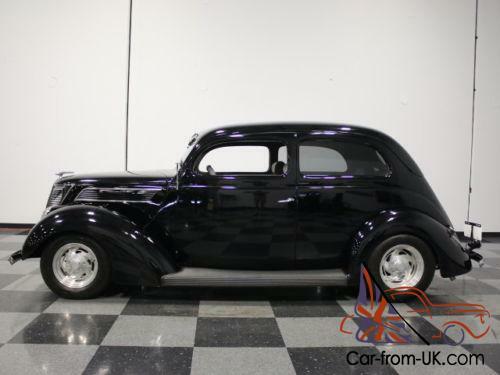 OK. so nobody will ever accuse the 1937 Fords of being ugly. so that's probably why the guys who built this one left the sheetmetal alone. No chopped top. no radical de-trimming. and no outrageous paint job. just clean. honest Ford steel in the original shape. Of course. fit and finish are worlds beyond what Henry could manage in 1937. even if he were willing to spend the money to get it to this level. Look closely and you'll note a few mods. including Vee'd windshield and blue dot taillights. but given how good it looks. you won't get more attention with radical modifications. The body was smoothed and finished to a very high standard before several coats of black paint went on. which gives it an appropriate look. It's got a few signs of use and age. 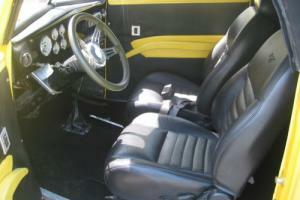 but if you appreciate the classic look and just want to update the driving experience. this is your car. The interior is the kind of place that you'd be happy to spend a weekend or more. thanks to comprehensive upgrades that make it as comfortable as a modern luxury car. The front seats are custom gray leather buckets and in back the original bench has been retained and covered in the same stuff. so it's bright and airy with a strong sense of style. Gorgeous custom door panels are attractive and functional. but not over-done. so they work rather well with the rest of the car. 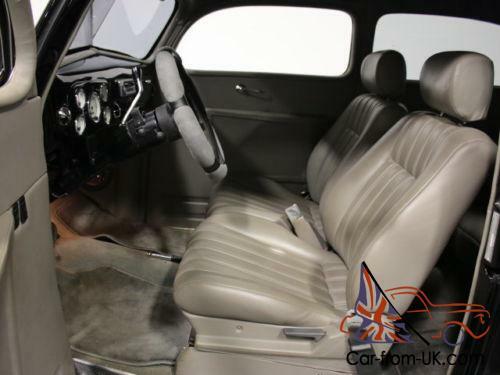 The original dash has been painted to match the bodywork and the stock instrument panel has given way to a trio of gorgeous gauges from VDO. A powerful A/C system. eyeball vents. and an AM/FM/CD stereo head unit are fitted into the center of the dah. 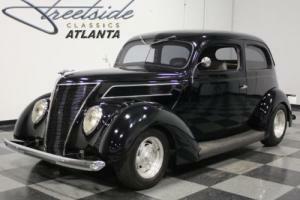 and it's so neatly integrated that you'll have a hard time believing that Ford wasn't building them this way in 1937. 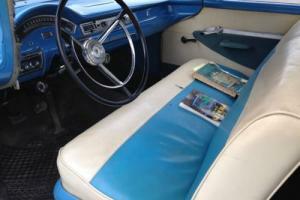 A late-model GM steering wheel lives atop a tilt column and aside from some light stains on the custom floor mats. it looks quite fresh. Under that slanting deck lid. you'll find a surprisingly spacious trunk that's fully upholstered and includes a space-saver spare with its own custom cover. The engine is a 350 cubic inch Chevrolet V8. so you know it's powerful and reliable out on the road. Fully dressed with lots of chrome. this will be part of the reason for the crowd forming around this car. 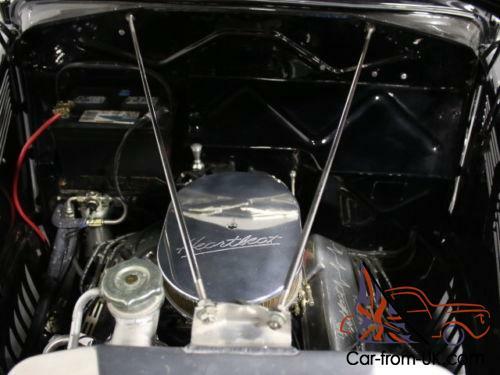 A Edelbrock 4-barrel carburetor atop an aluminum intake manifold is a time-tested combination. and the dual exhaust system was built as much for sound as for performance. because this car sounds amazing. 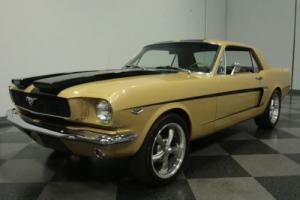 The front suspension is a Mustang II type setup with disc brakes and rack-and-pinion steering. while out back there's an 8-inch axle hanging on leaf springs. The quality of the workmanship is evident everywhere you look. and the fact that it's been driven and enjoyed means that it's all sorted out and ready to enjoy. Shiny billet aluminum wheels are a classic look and they're wrapped in sensibly-sized 215/75/15 rubber. so it rides well and doesn't rub on sharp turns. which is always important if you're actually going to drive your rod. Expertly engineered and nicely finished. this is the car you've been dreaming about driving this summer. Call today! 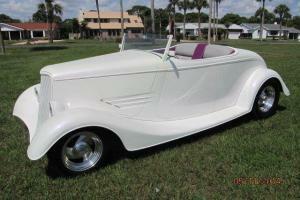 "33"Ford Cabriolet. Wildwood Brakes, 18K. Miles! Full frame. Mint! !